The established communion between Nano Stern & his audience may be justified with a simple fact, as an artist, he is very far from qualifying as a pretentious musician. The warmth with which he composes, interprets and communicates, combined with the always respectful need to pay homage to the great exponents of the Chilean Song project, is a life of learning and reflection. This link becomes more than evident when it comes to experiencing his work live, given that the audience is the only one really capable of turning a show into a true celebration. With Flor de Concierto, the symbiosis of elements was the main characteristic when it comes to aesthetics. Spring was the motive for this reunion and the way it was staged, symbolizing nature and fundamentally commemorating the "most beautiful flower ever to be born in our country, Violetta” (Parra). At 9pm sharp, this night began with the projection of a short film titled "Ha'i o Te Taini" (Meeting of Brothers), a record that reflects the constant search for knowledge of this globe-trotter that took him all the way to Easter Island to discover the rich culture that characterizes it. Stern appears on stage, and as was expected the attending audience of Teatro Caupolicán gave him an ovation that couldn't have been any bigger. 'Ópticas Ilusiones', 'El Comienzo' and 'Azul' configured the serene overture of this event with 'Lagrimas De Oro Y Plata' the first interaction between composer and his audience. Even if its not a directly political remark, he alludes to the fact that there are 3 congressman present in the mosh pit and he calls for the people not to protest but rather to suggest positive change if they run into them. 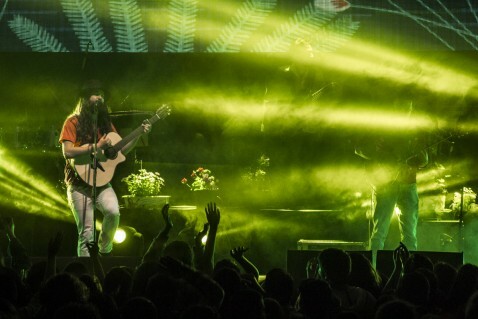 Immediately after and connecting to ‘La Raiz’ comes an audio visual display in which there is emphasis made on a new mega hydro electric project that threatens to destroy sacred Mapuche territory, to give way immediately to 'Vapor' that will be part of the new album and states that we're all made of water. A song announced as a ‘che’que rara’ and was premiered earlier this year on the Argentinean national television show 'Encuentro En El Estudio'. Intimate and overwhelming next comes 'Nube', for which the composer leaves the microphone and sings A cappella in one voice with his audience, turning this moment into the most luminous moment of the night. Later the collaborations start to happen, first with Chinoy where you can tell how much of a complicity emerges between their strings to give way later to introduce the guest band, Los Jaivas. After a couple of anecdotes and jokes, ‘Indio Hermano’, ‘Mira Niñita’ and ‘Takirari del puerto’ give a quota of mysticism to this versatile event. From here on the dominant mood is that of celebration...everything is party, everything is movement with ‘Tonada De Luna Llena’ and ‘Carnavalito Del Ciempiés’ - all of that energy arises and even more when Juan Ayala (Juana Fé) is invited to give an end to this amazing spectacle with ‘El Vino’. We are perhaps witnessing one of the most important periods in Nano Stern's career. His consolidation is already unquestionable and at the same time the multi-generational aspect of his music turns him into a key element of national art. In this concert the respect that he keeps for our cultures and traditions was evidence in all its light with a show that was simple, with a staging that shone from all angles and that basically is summarized in the final toast that Juan Ayala, with wine in hand declared, "That no-one is a prophet in his own land today can be denied because the stage of Teatro Caupolicán today is full of green shoots..let everyone rise up and let everyone know in Chile that we all love our brother, Nano Stern".